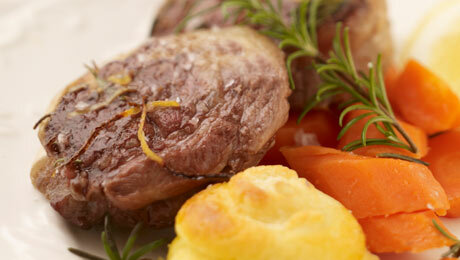 Get your lamb noisette from the butcher counter, prime rolled boneless Loin of Lamb from the best end. Prepare the noisettes of lamb by scattering with rosemary and lemon zest. For the pouch, mix together rapeseed oil, cider vinegar, lemon juice and seasoning. Season and pour the marinade over the noisettes. Cover and refrigerate for 30 minutes to 1 hour. Preheat oven at 230°C/450°F Gas Mark 8. Bake the lamb for 10 minutes, then reduce the oven to 180°C/350deg;F/Gas Mark 4 allowing 20 minutes (rare) to 30 minutes (well done) per 500g. Remove from the oven, and cover. Allow to rest 5 minutes. Arrange the noisettes onto a plate, garnish with a little extra rosemary and spoon over the jus from the roasting tin. Serve with duchess potatoes and salad. For the recipe for Duchess Potatoes, please click here.